Three to five links every weekday - satisfaction. not guaranteed. 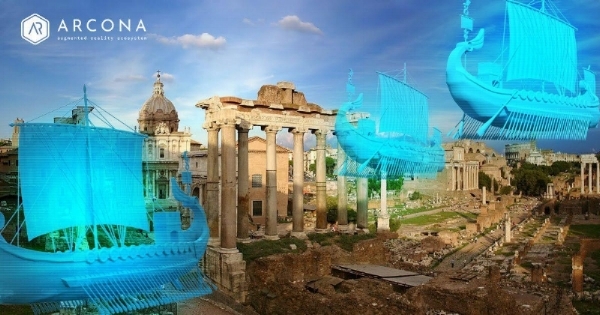 Piligrim XXI, an augmented reality (AR) startup designing the blockchain-based platform Arcona, which allows users to deposit virtual objects anywhere in the world, has obtained a patent for its new algorithms. This solution will facilitate the creation of a universal AR layer called Digital Land. Arcona launches its ICO on April 15. The patented algorithms will help Arcona create the world’s first digitized zones, which will appear next year in New York, London, Paris, Tokyo, Beijing, Rome, Mexico City, St. Petersburg, Istanbul and Barcelona. The goal is for an AR layer to cover the Earth’s surface by the end of 2019. For the past few years, augmented reality companies have set their sights on the larger consumer market, as big tech companies like Microsoft, Facebook, and Apple chase what they believe to be the next big platform. But now, the companies making augmented reality-powered smart eyewear are changing course: They're now going after selling to big businesses, as it now looks like it could be a few years before the devices are small and light enough for mainstream use. One great example of this shift towards businesses is ODG, a San Francisco-based company that has gotten a lot of attention for its Android-based smartglasses. ODG spent most of 2017 angling its R-9 glasses for consumers and developers. The glasses were able to show vivid images inside its lenses, putting similar hardware to a tablet on your head to project digital imagery over the real world. Now, ODG is taking its optical technology and integrating it with the oxygen masks worn by pilots, it announced on Wednesday. It looks like a step beyond Google Glass, integrating the headgear with a plane's onboard systems. MyDFS CEO Viktor Mangazeev believes tokenization and blockchain will make fantasy sports far more “transparent and user-friendly” and will allow players to invest not just in the games, teams and players, but also other players, by earning a share of their winnings. So, in theory, you could hitch your prospects to the best players because of the use of in-game cryptocurrency. It looks as if blockchain is going to gradually lead to more startups arriving in this arena. Distributed ledger technology could mean a large reduction in transfer times and fees, while affording a more transparent fantasy economy.